Victims of credit card skimming are completely blindsided by the theft. They notice fraudulent charges on their accounts or money withdrawn from their accounts, but their credit and debit cards never left their possession. How did the theft happen? Credit card skimming is a type of credit card theft where crooks use a small device to steal credit card information in an otherwise legitimate credit or debit card transaction. When a credit or debit card is swiped through a skimmer, the device captures and stores all the details stored in the card's magnetic stripe. The stripe contains the credit card number and expiration date and the credit card holder's full name. Thieves use the stolen data to make fraudulent charges either online or with a counterfeit credit card. Credit card skimmers are often placed over the card swipe mechanism on ATMs and gas stations, but the skimmers can be placed over almost any type of credit card reader. With ATMs, the crooks may also place a small, undetectable camera nearby to record you entering your PIN. This gives the thief all the information needed to make fake cards and withdraw cash from the cardholder's checking account. Occasionally, certain retail and restaurant workers who handle credit cards are recruited to be part of a skimming ring. These workers use a handheld device to skim your credit card during a normal transaction. For example, we routinely hand our cards over to waiters to cover the check for a restaurant. The waiter walks away with our credit cards and, for a dishonest waiter, this is the perfect opportunity to swipe the credit card through a skimmer without being detected. Once the victim's credit card information is stolen, thieves will either create cloned credit card to make purchases in store, use the account to make online purchases, or sell the information on the internet. Victims of credit card skimming are often unaware of the theft until they notice unauthorized charges on their account, have their card unexpectedly declined, or receive an overdraft notification in the mail. Credit card skimming devices are crafted to blend in seamlessly with the machine it's placed on. Unless you're specifically looking for a skimming device, you may not notice anything out of the ordinary. Look out for credit card skimmers anywhere you swipe your credit card, but especially at gas stations and ATMs. Becoming familiar with the look and feel of regular credit card readers can help you detect when there's something out of place. Here are some ways to detect a credit card skimming device. A credit card reader that sticks out far past the panel. Skimmers are designed to fit over the existing credit card reader. If you notice a credit card reader that protrudes outside the face of the rest of the machine, it may be a skimmer. This is especially the case when an additional part seems to be affixed to the rest of the credit card reader. At a gas station, you can compare a suspicious credit card reader to the readers at nearby pumps. If something looks out of the ordinary, avoid paying at the pump. Pay inside or go to another gas station. Parts of the credit card reader are loose or move when jiggled. The credit card reader should be securely in place. Moving parts are a sign the reader has been tampered with or that a skimming device has been affixed to the existing reader. A security seal that has been voided. Gas stations often place a security label across the gas pump that lets you know if the cabinet panel on the fuel dispenser has been tampered with. When intact, the label has a flat red, blue or black background. However, once the seal has been broken, the words "Void Open" appears in white. If the seal is broken, it's a sign that someone without authorization has accessed the cabinet. Let the gas station attendant know and do not use the credit card machine at that pump. A pinpad that's thicker than normal. In addition to a skimming device, thieves may place a fake keypad on top of the real one to capture your keystrokes. This way they can capture your pin or billing zip code in addition to your credit or debit card details. If the keys seem hard to push, eject your card and use another ATM. Use a bank-operated ATM, which is less likely to have a skimmer, rather than an ATM at a store or gas station. Thankfully, many banks and credit card issuers are becoming better at detecting fraudulent transactions and may not process suspicious charges until you verify that you initiated the transaction. Simply using your credit card puts you at risk of becoming a credit card skimming victim. Credit card skimming incidents can be difficult to detect. Unless you know what you're looking for, it can be extremely difficult to detect skimming devices. Catching fraudulent charges related to a skimming incident requires you to watch your accounts frequently. Monitor your checking and credit card accounts online at least weekly and immediately report any suspicious activity to your bank or credit card issuer. 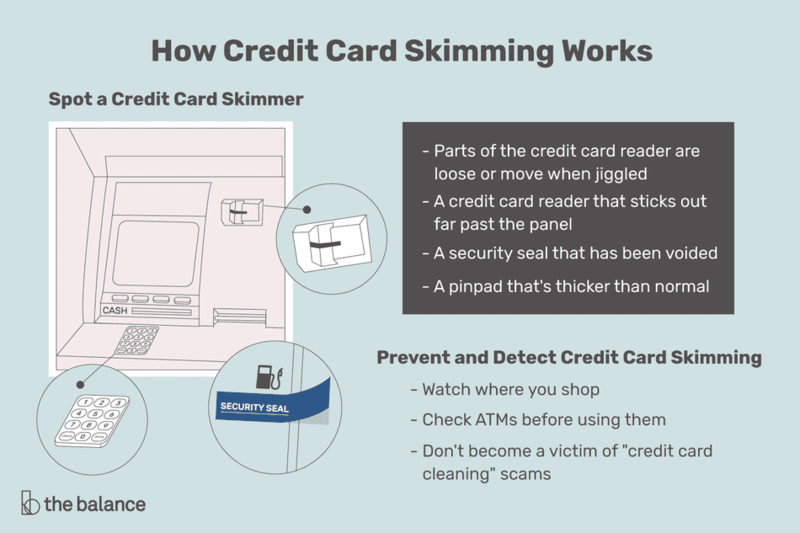 Here are a few more tips for avoiding credit card skimming. Watch where you shop. Restaurants, bars, and gas stations seem to be the places where credit card incidents happen most frequently. Retail store self-checkouts and ATMs, especially standalone ATMs (those that aren't at the bank) are also places that skimmers can be found. Check ATMs before using them. At ATMs, skimmers often place a camera within view of the keypad to steal your PIN. These cameras are often tiny and difficult to detect. When you're using an ATM, cover your hand as you type your PIN to keep a camera from catching a view of what you're typing. Don't become a victim of "credit card cleaning" scams, where thieves claim to clean the magnetic strip on your credit card to help it work better. These thieves simply swipe your credit card through a credit card skimmer and take your credit card information. If you think you've been a victim of credit card skimming, contact your bank or credit card issuer even if you haven't spotted any fraudulent charges. The sooner you report your suspicions, the more you shield yourself from liability of unauthorized charges. Provide as much detail about the possible location of the skimmer, e.g. the location of the ATM or gas station you visited, can help the bank prevent future losses. Alert the Federal Trade Commission. They often work to break up large credit card skimming rings. Your complaint will help catch the thieves.